There are a lot of great films getting drunk, high, or otherwise loaded and pursuing the idea of a drunken point of view. It’s not so much the drunkenness itself but that intimate connection between camera and perspective. In Ken Russell’s Altered States, scientists even imagine inebriation as the entry into a new reality, in which drugs become the cinematic catalyst for playing with light, sound, angle, color, and perspective, all in ways that defy typical perception. 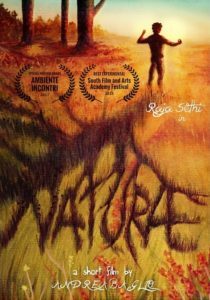 Andrea Baglio’s NATURAE (2017) is a short made with that tradition in mind. In the film, a young man–caught in the throes of a drunken haze—staggers into the wilderness (or, at least, a very large garden). There, the camera seems to shift from watching the young man to adopting his point of view. This is where the photography becomes beautiful, almost sentient. As we jump back and forth between the view of our drunken protagonist and his POV, we see nature as an oversized expression of the sublime. Flowers grow to oversized behemoths; winter trees are shrouded in mystery and secrets of the world. Nature is by turn beautiful, horrific, gross, overwhelming, and sensual. NATURAE gestures toward Antonin Artaud’s experimental theater and art spaces, toward the happenings of the 1960s in which the sensory experience mattered far more than the narrative representation. While it doesn’t necessarily completely reach that sensory overload, it nonetheless brings a fresh sense of experimentalism into a contemporary film, which is so often dominated by strong storylines. NATURAE celebrates the pure image, which really can only work if the photography is strong, which it is.